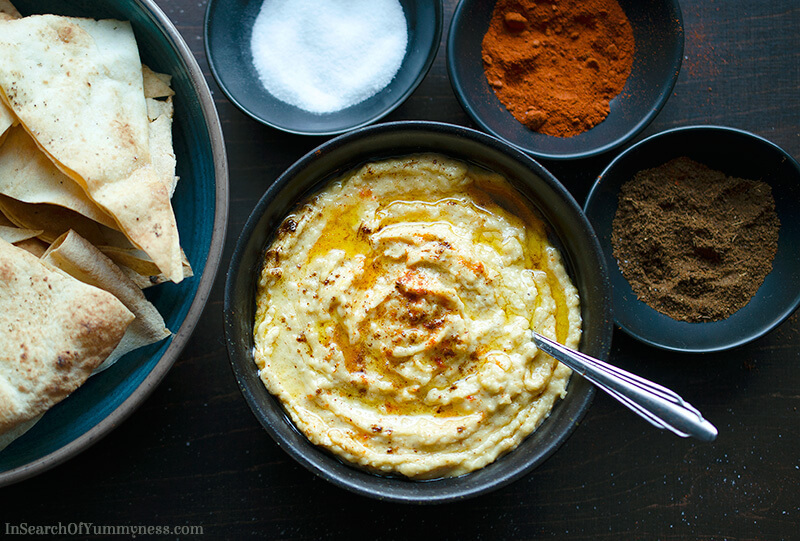 Hummus doesn’t have to be difficult to make. This recipe uses canned chickpeas to cut down the prep time, and it’s so much better than store bought! We’re more than halfway through the year – how are those healthy eating resolutions going? If you’ve fallen off the wagon a few times, don’t stress. It happens to the best of us. One thing that I’ve noticed on my quest to take better care of myself this year is that good habits are hard to build – but easy to break. I’m not particularly good at getting enough sleep or taking time for myself, and every time I start getting into a better routine I end up having a day or two where I just rebound. It just shows that living a healthy lifestyle takes work (so if you’re struggling, don’t be too hard on yourself). Lately I’ve been stress-eating again… I’ve been trying to convert that into a stress-cleaning habit, but I’m not quite there yet. The past month has been an emotional rollercoaster, and I’m craving ALL the sweet things to make myself feel better. I’m allowing myself small treats here and there, but now that I’m prediabetic I really have to be careful. I was actually doing really well over the past 4 months, and managed to hit my goal weight! But things are changing, and I’m honestly a bit worried about how I’m going to cope. I’m moving to a new job, which is super exciting but also a bit terrifying, and I’ve got some personal stuff going on that just has my emotions running all over the place. The struggle to keep up with my healthy eating plan is real. 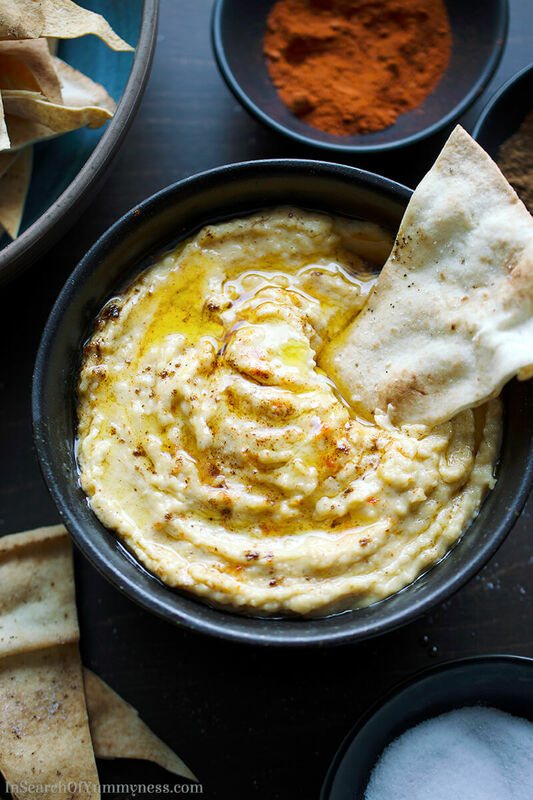 The foundation of my healthy eating philosophy is to eat nutritious food (like this healthy hummus recipe!). That means less fast food, less junk food, and more fruits, veggies, legumes etc. I’ve been trying to stick with it, although I’m still eating Shawarma every week… but I order it with rice (not fries) so I figure that makes it slightly better. Anyhow, this hummus recipe has been really handy to nibble on during the week. It’s tasty, filling, and I can eat it with cut up veggies for an extra healthy snack. I know you can easily buy all kinds of hummus products at every major grocery store now, but I haven’t found one that I enjoy yet. Sometimes they’re too sour, too garlicky or just plain chalky in texture. Plus, for the price, it’s a lot more cost effective if I just make a batch at home myself. If you want to use dried chickpeas, you’re going to get even more bang for your buck. 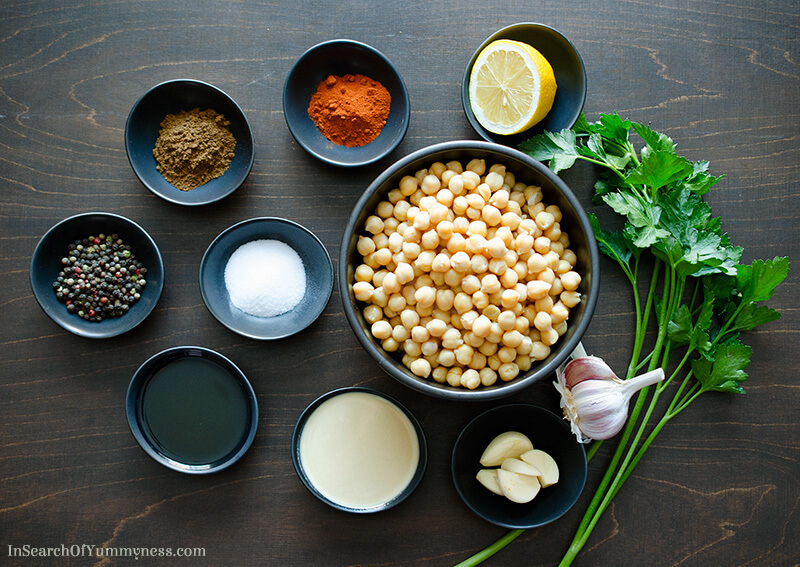 However, you will need to soak your chickpeas overnight with a bit of baking soda, and then rinse, drain and boil them in fresh water for about an hour before proceeding with the recipe. I never plan ahead far enough to do that, so I make mine with canned chickpeas. Don’t be tempted to skip the boiling step, even if you’re using canned chickpeas. The canned stuff is too dense to be able to blend into a creamy dip, but 20 minutes in hot water makes a huge difference. 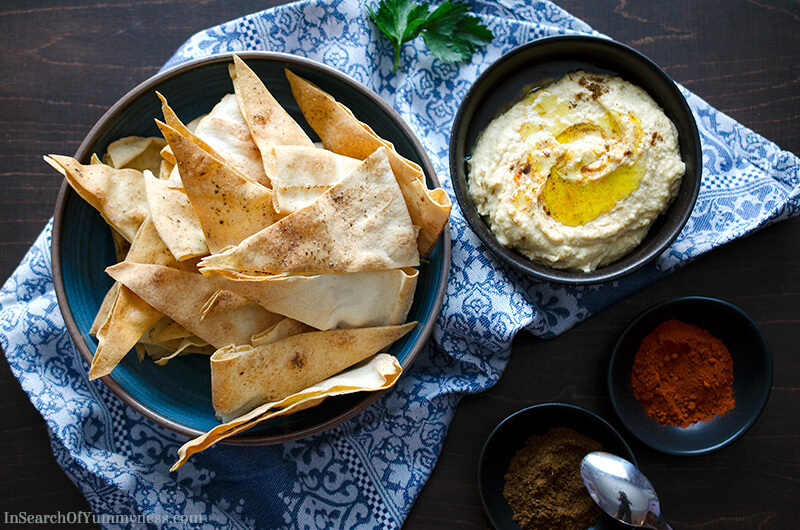 This hummus recipe is really easy to make, and it’ll last a few days in the fridge. So if you’re into meal prep, you could put this together Sunday night and have it as a snack every day during your work week. It’s tasty with pita chips, which I’ll explain how to make in a bit (SO easy! ), or carrot sticks, red bell peppers strips and other veggies. I’ve been told it’s also a decent spread for sandwiches, but I haven’t actually tried that myself yet. This recipe has garlic in it, but the flavour is very mild. This is because I leave the garlic to “cook” in the acid of the lemon juice for about 10 minutes before putting the hummus together, which really helps to tame the sharp bite of raw garlic. The rest of the ingredients are porportioned to add flavour, but not overpower the flavour of the chickpeas. I’ve used only a small amount of tahini, as I find that too much makes the hummus bitter. Of course, you should mess around with the quantities until you find what works for your personal preference. Another key thing to note for this recipe is the addition of ice cubes. I realize that might sound super weird, but it gives the hummus a beautiful smooth texture. I know some people like to use aquafaba (otherwise known as the goop in your can of chickpeas), but I refuse to eat that. It looks gross, and it’s FULL of sodium. You can significantly cut down the amount of sodium of any canned bean or legume by washing that gunk off. The more you know! 2. Cut the pitas into triangles (easiest way: cut the circle in half, then half again, then half once more). 3. Put the triangles into a bowl, drizzle with olive oil and season with salt. 4. Spread the triangles out on a sheet pan, bake for 6 minutes or until crunchy. I try not to overcook mine because I find they become hard instead of crunchy. 5. Let the chips cool the serve with hummus. Chips can be stored for a few days in a zip-top bag. 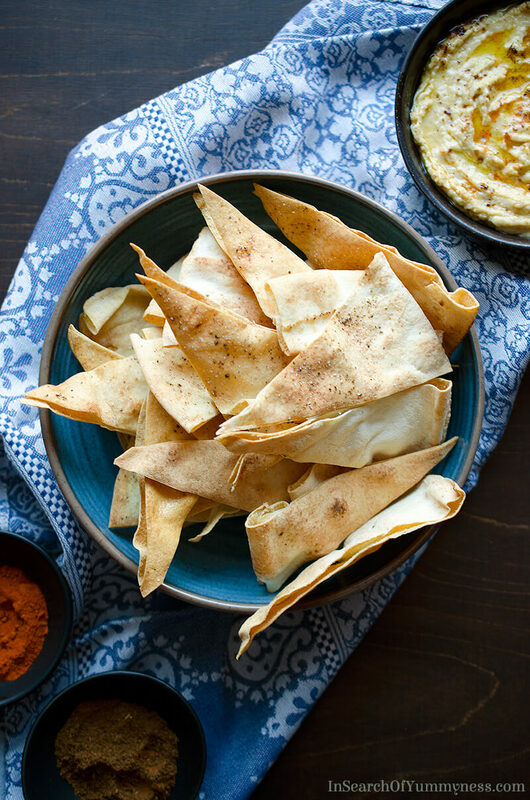 If you try making the pita chips or hummus, let me know in the comments below, or snap a photo and tag me with @InSearchOfYummyness or #InSearchOfYummyness on Instagram! I’d love to see what you make! A simple and healthy spread, that pairs well with pita chips, carrot sticks and red bell pepper strips. Fill a saucepan with water and place over medium heat. Add chickpeas to pot with a bay leaf, and cook for 15-20 minutes or until chickpeas are very tender. Drain. Meanwhile, in a food processor, add garlic and lemon juice and blitz under pulverized. Allow to sit 10 minutes. Add the chickpeas into the food processor, along with tahini and cumin. Blend to crush the chickpeas, then stop the processor. Add the ice cubes, close and blend again. While processor is running, drizzle in a little bit of olive oil. Blend until the hummus is smooth. Serve with a sprinkle of paprika, if desired, and a splash of olive oil. Store in an airtight container in the fridge up to 1 week. Serve at room temperature. If using dried chickpeas, soak chickpeas with a 1 tsp of baking soda overnight, but do not cook with baking soda as this can result in a bitter flavour. Cook the dried chickpeas for 45 minutes to an hour, or until they are soft and almost falling apart. Blending the garlic with the lemon juice and allowing it to sit helps to mellow the sharp bite of raw garlic. This post may contain Amazon affiliate links, and I will be compensated if you make a purchase after clicking on my links. This looks so good it reminds me I need to pick up some tahini for when I go back to Cuba, they have lots of chickpeas but tahini really makes it. Thanks! I’m on the hunt for a better brand of tahini to use at home. The one I bought is a bit bitter. I love a good hummus recipe.